This year’s competition received almost 300 entries between September and January, before a panel of technical experts from supporting trade associations determined which of the entrants had made it through to the final round. Elliotts Premier Roofing is one of just four finalists in the sustainable (green and vegetated) roofs category. 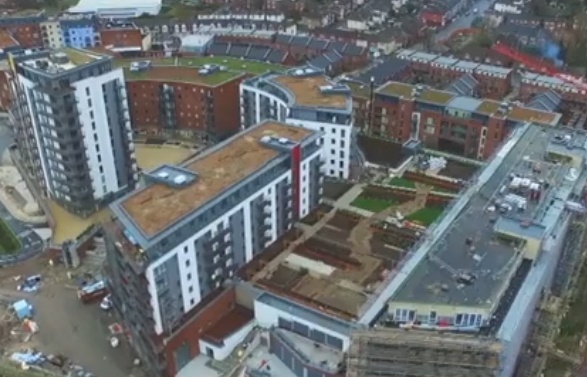 The nomination acknowledges the company’s delivery of all waterproofing and roofing on the Centenary Quay development by Crest Nicholson in Woolston, Southampton. The development includes 102 apartments with high-rise penthouse flats, retail and commercial space, built by Willmott Dixon. Tom Elliott, managing director of Elliotts, said: "We are proud to be shortlisted in the UK Roofing Awards 2016 as it shows our commitment to quality and green builds for our customers. “For over 175 years Elliotts has been known and well respected for its roofing provision and we've proven this with our work on high profile developments across the south. We have great growth plans and are looking forward to the future of Elliotts Premier Roofing." The winners of the UK Roofing Awards 2016 will be decided by a panel of construction professionals at a ceremony on Friday 13 May.